Ok, forget the title of this post for a moment. We came down to Charlotte, NC this weekend to watch youngest daughter dance. Her tonsils are the size of large marbles and she is exhausted, but by goodness she is going to dance. 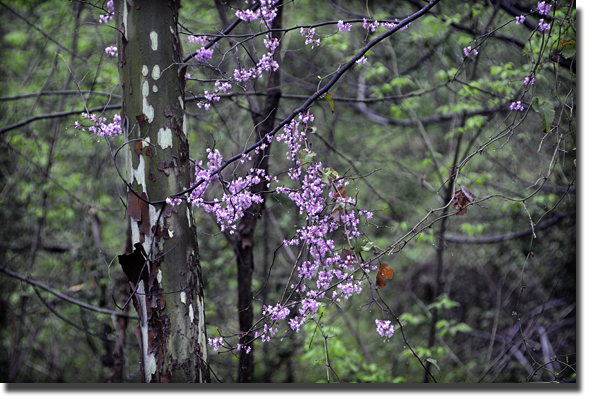 As we drove down in elevation, the baby green leaves and budding redbud trees became more and more evident. Such promise for the mountains. In our copious amounts of spare time waiting for youngest, husband suggested I buy new clothes for my job. This did not amuse me. Buying clothes + Me = one hell of a depressing situation. I have an oddly shaped body. Suffice to say, there are no such things as respectable clothes to fit me. But my husband insisted we visit South Park Mall anyway. We stopped in Brook Brothers first. "Just try on some slacks," my husband coaxed me. I reluctantly entered a dressing room. I was horrified at the site of my reflected imaga in the mirror. The pants fit my buddah belly, but the legs and seat were large and sloppy. I came out, shoved the pants into the clerks arms and ran out of the store in a hissy. "I hate shopping and I'm never going to eat again. Ever." I whined. Instead of giving in, my not-normally-patient husband guided me by the arm back into the mall entrance. "Let's just look around a bit longer," he suggested. Eventually, I found clothes within Ann Taylor's Loft tempting. My husband was more proactive in the hunt than I. In fact, he reminded me of Clinton Kelly of "What not to wear," as he effortlessly matched slacks to blazers and pumps to blouses. Finally, I found the gumption to try on some more clothes. And let me tell ya, nothing boosts the shopping stamina faster than needing to go down a size to get a better fit. We went into every single department store looking for ladies apparel. It was a hard 5 hours but we managed to find a summer weight jacket, three pairs of slacks, and a couple of blouses. Now all I have to do is find a place to get them altered back home because I'm not an off-the-rack kinda gal. My husband never once complained, in fact, when we returned to the car he said, "I think that may be a personal best shopping record you just shattered. You should do that more often." I think he just likes saying that because he can get away with mouthing the words and them not costing him too much money. He can never accuse me of spending all our money on clothing. But on camera and computer gear? I'm dangerous. Like maps and world geography? Take this quiz. My eldest just scored a 98. My top score is 62.